The best scuba diving fins make a BIG difference! Whether you are a sport diver, technical diver, freediver, spearo, or a happy holiday snorkeler, the need for a good set of fins is a prerequisite to propelling yourself through the water. Without them we are pretty much immobile, certainly in dive gear. Oh, and in the dive world we don't call them flippers. Flipper was a dolphin and we don't take his name in vain! We call them fins. What sport do I plan on participating in, e.g. scuba diving, snorkeling, free diving, spear fishing, or swimming? What temperature of water will I be exposed to? Is propulsion important to me? If a little fin is good, a lot must be better! As true as that statement sounds, it is actually quite incorrect. Fins are a sport-specific piece of equipment that can greatly affect how well you perform during your time in the water. Recreational swimmers and snorkelers tend to fall into the "less is more" category when it comes to buying fins. The majority of swimmers and snorkelers don't need the bells and whistles that many fins offer. Typically, a more basic fin design will meet your needs. The length of fin needed by swimmers and snorkelers is typically shorter than those needed by scuba divers and are definitely shorter than those used by free divers. If you feel like you are fighting your fins rather than being aided by them, then your fins are probably meatier than what you need. A simple smaller design is usually much better for swimmers and snorkelers. 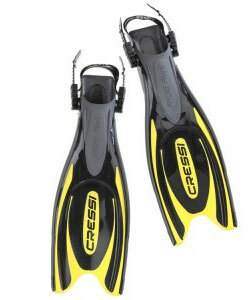 The Cressi Pluma is our best selling full foot fin for snorkelling. We highly recommend them. They deliver high performance, extreme lightness and easy kicking, and astonishing comfort. 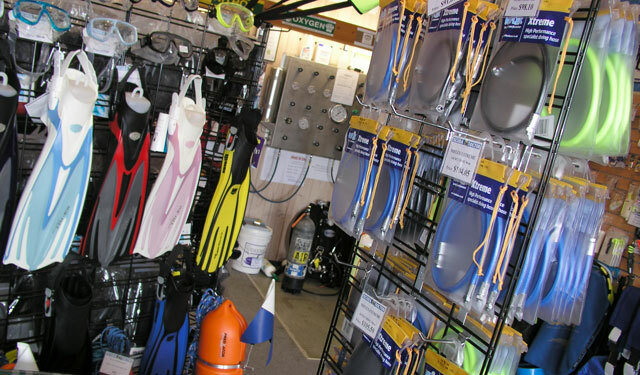 Check out our extensive range of Snorkelling Fins and Swimming Fins. Scuba divers tend to desire more fin features than do recreational swimmers and snorkelers. Scuba divers are frequently more aware of the propulsion power offered by their fins. Scuba fins tend to be the same length or slightly longer than snorkeling and swimming fins, which means they require more leg strength and power to kick effectively. Check out our extensive range of Scuba Diving Fins, or our selection of the Top 10 Best Diving Fins. Free diving is a sport during which a person submerges to significant depths without the aid of an air supply. In order to help the diver to submerge and then surface on whatever air is in his/her lungs, free dive fins are designed to make the most out of each kick. All of the same principles apply to those spearfishing. The spearfish and freediving fins are considerably longer than swimming/snorkeling and scuba diving fins in order to move the diver the greatest distance with the least amount of kicks. Typically, longer fins offer more resistance, which gives the free diver more bang for his/her buck, which is why freediving and spearfishing fins are so much longer than fins for other water sports. The long blade and comfortable foot-pocket system makes this a perfect fin choice for deep freediving and spearfishing. Some scuba divers also like using these fins. Check out our extensive range of Freediving Fins and Spearfishing Fins. Water temperature can greatly affect the gear needed by divers. The gear you wear can be a factor in determining the fins you take into the water with you. If you are in cold water, you will be in more exposure protection gear, including boots or booties. 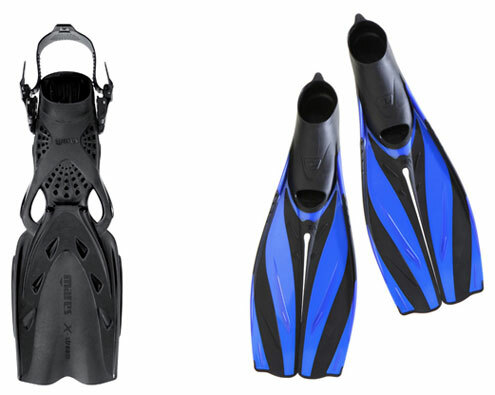 If you dive wearing boots (either neoprene or hard sole), an open heel fins is definitely what you'll want to wear. An open heel pocket accommodates boots because the heel strap wasp around the back of the diver's boot and can be adjusted to offer a comfortable fit. If you wear rigid-sole boots, the open heel foot pocket will easily accommodate your boot's stiff sole and heel support. Rigid boot soles and heels also help keep the fin strap from slipping off of your heel. If you are in warm water, you are less likely to wear gear that will protect you from the elements. Therefore, you are less likely to wear boots into the water. Without the need for boots, you won't need to wear open heel fins. Closed full foot fins encompass your entire foot, much like a slipper. If the fin rubs against your ankle bone, it is too big or the wrong design for your foot. On the other hand, if your feet start to tingle while wearing your fins, they are too small. Even in the temperate (colder) waters of Southern Australia, many freedivers, spearfishers and snorkellers prefer to use full foot fins. They typically put 3 or 5 mm neoprene socks on their feet to provide some thermal protection and buy fins sized to accommodate their foot with the socks on. However, if your entry or exit is over rough or sharp ground then the socks won't provide enough protection, which means boots and open heel fins are required. Scuba divers are serious about their kicking ability and underwater thrust. Fin science has taken kicking to a new level. 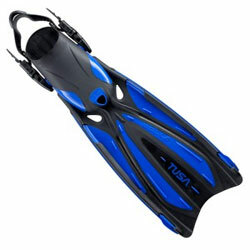 Scuba diving fins now offer features like channels and split fin designs. Traditional plastic blade fins are the least expensive, but offer good performance. Most entry level fins are constructed this way. They are usually highly durable and reasonably light for the traveling diver. 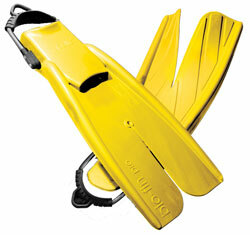 If you're a no fuss, no frills diver or snorkeller then blade fins are highly appropriate. The blade is extremely flexible and has snap requiring less kicking effort. The side stringers that extend all along the blade and two flaps situated along the end of the blade itself make the fin very directional. Rubber channels are inserted into the blade so the fin effectively funnels the water behind you as you kick down. Channels help move the water across or through the fin, which allow the diver to move through the water quite rapidly. Channels increase the diver's speed because they offer less surface area resistance in the water. Additionally, channels (depending upon their placement) offer extra fin flexibility, which means the fin can bend further and move more water with each kick cycle. RRP: $209, Our Price: $179, You Save $30 (14%). These legendary fins now come equipped with the patented Mares heel bungee straps which increase diver safety and provides fast and easy donning and doffing. The sturdy blade and flexible tip of the Mares Quattro+ produce a propulsive snap that rockets a diver through the water. The theory behind split fins is as the diver kicks his/her foot downward, the water channels through the split and creates a spring-like action that resembles the physics of a dolphin or whale's tail. This action increases each kick's power and effectiveness while reducing the amount of fatigue that the diver experiences. Split fins are also very popular among divers who experience knee pain or have had knee surgery. The split fin reduces the amount of resistance felt by the diver's joints while offering a great deal of effectiveness with each kick. Many experienced diver's criticise split fins citing various reasons. Yet split fin designs have consistently outperformed other fin designs in independent test over many years. Split fins require a flutter kick action to work at their optimum potential. We believe most of the critics have failed to adapt their kick action when they've tried split fins, and instead have used their more traditional fin action. The result is much lower performance than happens when you use the correct flutter kick action for split fins. RRP: $375, Our Price: $320, You Save $55 (15%). Any way you slice it, these fins are the pack leader. They fins generate ear-bending speed and power with virtually no leg stress, are responsive in turns, and nimble when negotiating tight places. Plus they are comfortable and easy to use. Fins are a very basic piece of equipment, but that doesn't mean they are without need from time to time. Below are some fin-related accessories that will enhance your time in the water and extend the life of your fins. If you have ever fought with rubber fin straps and lost the battle on more than one occasion, spring fin straps might be the way for you to win the war. We love them. At the end of a shore dive, most divers begin ditching their gear when they are approximately waist-deep in the water. Fatigue and the juggling act that accompanies gear ditching can result in dropped fins. Safely clip your fins to your BCD with a utility strap. Make sure the gear you pick up is yours — make sure the gear others pick up isn't yours. Use a waterproof permanent marker to put your name or contact information on your dive gear. By keeping your gear organised and separated, you'll be ready to hit the water in a timely manner. Fin bags also keep your fins from damage. If your fin strap breaks or is worn out, it is time to make a change. If you're on the beach without a backup, say goodbye to your time in the water. This simple piece of replacement gear is priceless when needed. The last thing you want to do is find out on the beach or dive boat that something is wrong with your gear, and not have a way to fix the problem. By carrying a save-a-dive kit, you can still safely enjoy your dive or snorkeling adventure just like you planned. Check out our Fin Accessories section to make sure you have the fin bits and pieces you need. 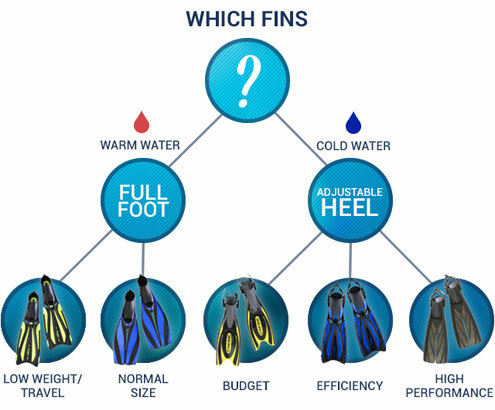 For full-foot fins, your shoe size is the best guide to your fin size. 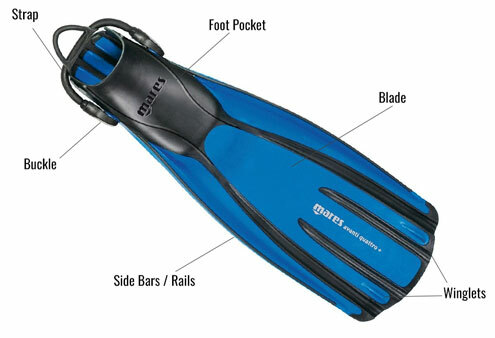 For open heel fins being used with dive boots, it's more complicated. Unlike shoes, the question is difficult to answer with open heel fins because a 'shoe' size is only part of the answer. The brand and type of neoprene dive bootie you wear, particularly if you wear heavy soled or rock boots, will have as much effect on the selection of the size of your open heel fin foot pocket as the shoe size. Some people, especially those with high arches, prefer a loose fit in their fin and others prefer a snug fit. Fitting drysuit boots in the very large sizes is especially problematic. There is no size standardisation between brands of fins (or sometimes even between different models from the same brand) and so you cannot assume that a size in one brand of fin is the same dimensions as the size in another brand; even when the designs look very similar. Taking some actual measurements of your boot while on your foot and comparing to our foot pocket dimension charts will help determine the size selection for your desired fit. Please do you best to determine your correct fin size before you order! If you are not certain about your fin size then our recommendation is not to order until you can obtain that information. While The Scuba Doctor will accept fins for return, you will be responsible for return shipping costs both ways. Return shipping costs on fins can be expensive because fins are a relatively low priced item that has a high 'dimensional weight'. Your complete satisfaction is our goal, so please consider carefully before purchase.